One of the most iconic paintings hailing from the Dutch Golden Age is Vermeer's Milkmaid. In 1658 he depicted a maid with clothes and surroundings in very distinct colors. How important are the colors to this image? 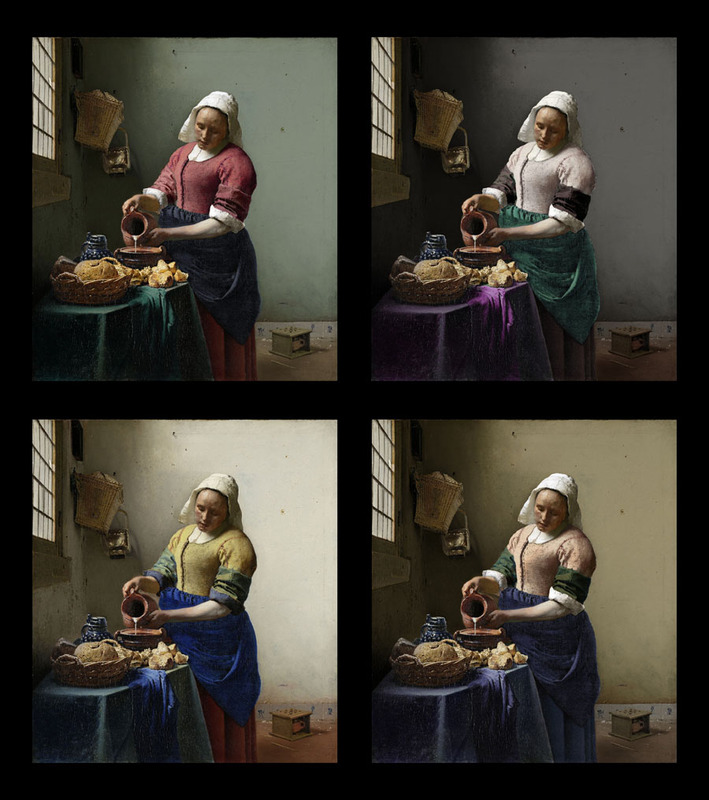 What if we could transplant the colors of other renowned pictures onto the Milkmaid? Can you guess which is the 'real' Milkmaid? Click here to see if you get it right. Earlier this year it was revealed that sculptor and color-hoarder Anish Kapoor had been given exclusive rights to the blackest black in the world. Called Vantablack it was developed by British company NanoSystem—specialists in nanomaterials—who created it for military and scientific uses. However, after Kapoor contacted the company he was allowed to be the only artist in the world given permission to paint with it. 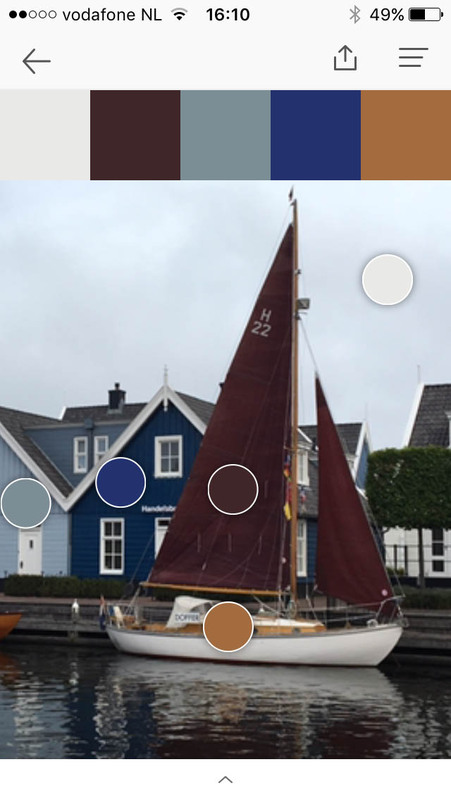 Pantone recently released a new app for iOS, called Pantone Studio, and it's pretty cool. It has everything you would expect, like an overview of all the Pantone color collections, and data on individual colors. Off course you can also save your own palettes. But there's more. You can load an image and extract colors from it. There are more apps doing the same. But most of them depend on an algorithm that automatically turns image colors into paint. Problem is, a photo of a blue wall is not the same as a pot of blue paint, because each individual photo has its own individual lighting situation, which hugely affects the colors. The Pantone app doesn't solve that problem, but works around it by allowing you to pick your own colors in the image. So you can also pick a color of the air, your skin or a leaf. It's a more impressionistic approach, which leads to less worrying whether or not the color you get exactly matches the color of the object in the image. Secondly, the app can even find new, matching palettes for you in the vast collection of Colourlovers. Colourlovers.com is a website that has collected a huge amount of hand made color palettes. All in all, Pantone did a really good job with this app. You can use it for free with a limited number of colors. 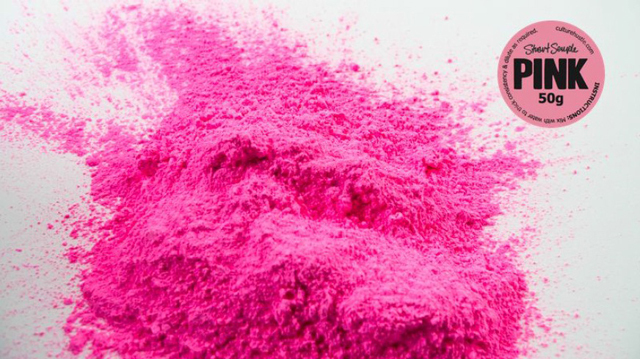 Full access to all the Pantone colors and references requires a paid subscription. Why the heck are de democrats blue and the republicans red? Surely there must be a deeper psychological meaning to this. Right? Both parties historically use an animal for a symbol, the republicans an elephant and the democrats a donkey. The now-famous Democratic donkey was first associated with Democrat Andrew Jackson in the 1828 presidential campaign. His opponents called him a jackass (a donkey), and Jackson decided to use the image of the animal on his campaign posters. Later, the symbol was made famous by cartoonist Thomas Nast. Nast also invented the other famous symbol—the Republican elephant. In a cartoon in 1874, Nast drew a donkey clothed in lion's skin, scaring away all the animals at the zoo. One of those animals, the elephant, was labeled “The Republican Vote.” That's all it took for the elephant to become associated with the Republican Party. However, both parties used the colors of the US flag, red, white and blue. Most of the older logos show all three colors. Only since election night 2000, blue has become the identifying color for the Democratic Party, while red has become the Republican color. That night, for the first time, all major broadcast television networks used the same color scheme for the electoral map: blue states for Al Gore (Democratic nominee) and red states for George W. Bush (Republican nominee). Since then, the color blue has been widely used by the media to represent the party. This is contrary to common practice outside of the United States where blue is the traditional color of the right and red the color of the left. For example, in Canada, red represents the Liberals, while blue represents the Conservatives. In the United Kingdom, red denotes the Labour Party and blue symbolises the Conservative Party. 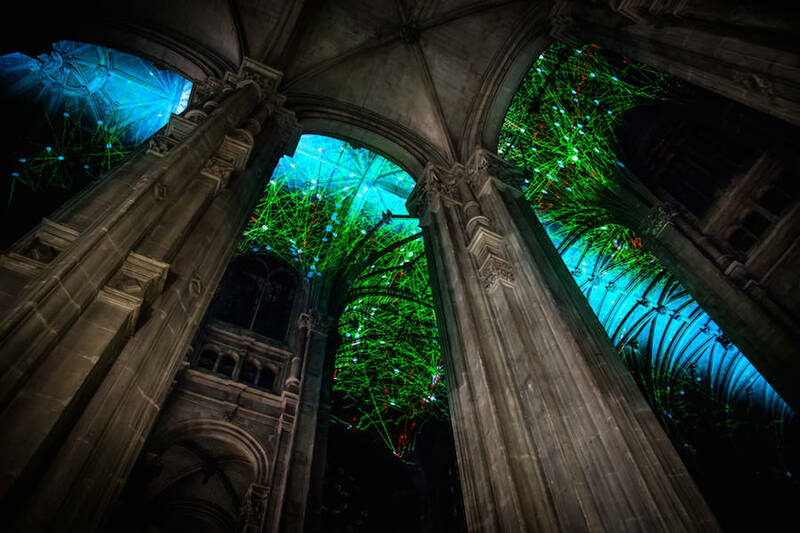 Recently, the Mexican artist Miguel Chevallier created 'Heavenly Vaults' in the church of Saint-Eustache in Paris. In Chevallier's own words: "These digital constellations of pixels immerse visitors in an atmosphere bathed in light while opening unto infinity." This creation was accompanied by musical improvisations played by Baptiste-Florian Marle-Ouvrard, organist of St. Eustache and singers of Les Chanteurs de Saint-Eustache. 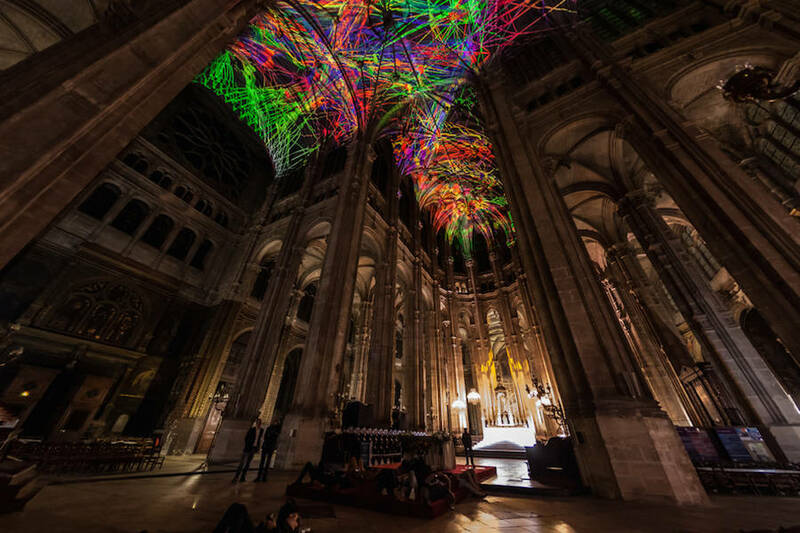 Heavenly Vaults was an interactive digital installation projected on the ceilings of the church. Astonishing imaginary sky maps emerged in real time. Colored light shone in the form of sinuous networks. Large meshes were formed and deformed, following the movements of visitors. This work resonated with the architecture of the building and highlighted the volumes of columns and arches. Surprising effects of trompe l'oeil were created, to amplify the impression of height and lightness in the church. Unfortunately, the installation only ran one night, on the first of October. But there's a great video available, as well as many pictures. Each color can give its own message. It can connote a brand, it can connote an emotion. It can reflect a memory. But for that to happen, the color must come with a story. Color isn't the story, it merely carries the story. 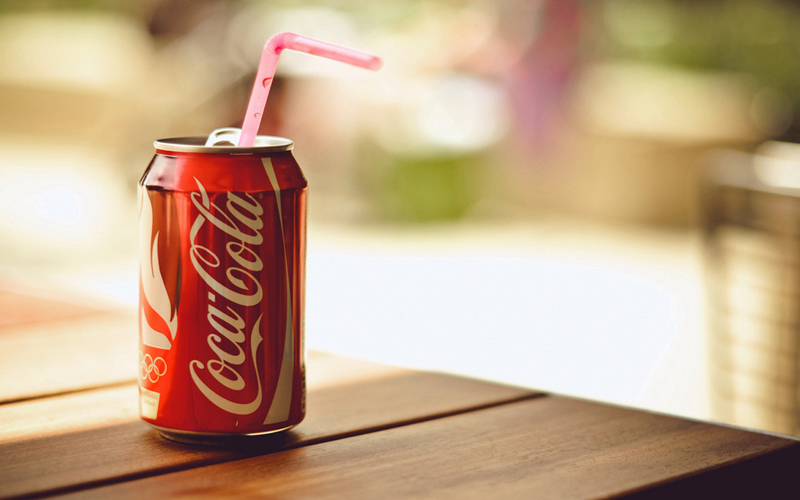 Red, as used by Coca Cola, comes with its own story. 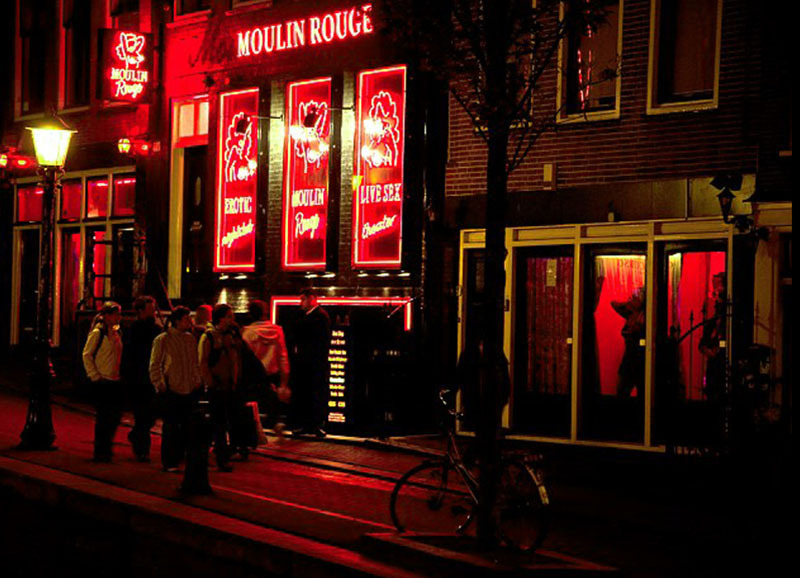 Red, as used in a red light district, comes with a whole different story. Obviously, for it to work, the color has to fit the story. A green light district simply doesn't have the same ring to it. Context plays into it. Shape plays into it. All that is part of a fluidity to create a great story. On the left, a shoe worn by Asafa Powell, who held the 100 metres world record for years. On the right your average training shoe. Similar colors. But it's pretty clear which shoe was made to shatter world records.